Taking prompts from Carrie Lambert-Beatty’s “Make-Believe: Parafiction and Plausibility,” Bruno Latour’s “Why Has Critique Run out of Steam?” and Terry Smith’s “Contemporary Art and Contemporaneity,” this hypertext seeks out art works and practices that we might call recuperative - those that grapple with the present by carving out space to feel, mourn, dream, and build. Videos by: Alexis Shotwell, Donna Haraway & Anna Tsing, Allora & Calzadilla, Metahaven, Danny Giles, Ruby T, Black Quantum Futurism, Fictilis, Hito Steyerl, Irena Haiduk, Coco Fusco & Guillermo Gómez-Peña, The Yes Men, Walid Raad, and Solange Knowles. This essay combines personal reflection and philosophical debate to interrogate the phenomena of artist-residencies as experimental communities and think-tanks, and how artists may collectively shape a new ethics towards our respective communities. An experiment in honesty and unanswered questions. Commissioned by the artists for a catalog documenting their collaborative installation, this short essay explores errors, auras, and the many unders of the Chicago art scene through the lens of two artists who labor to transform a strange space into a strange space. <<from the press release>> THE SUB-MISSION is converted into a sensual—but not sensational—room. The space drips, drags, and droops into a gooey and inflated environment. Print catalogs are available through the artists. In the Summer of 2017 I was asked to participate as the writer in residence for a project called The Ark organized by the artist Grace Ndiritu at Les Laboratories d’Aubervillers, Paris. The Ark aimed to focus on developing the role of artwork in relation to science, spirituality and politics, in order to provide a platform for thinking about the contemporary global crisis and how to imagine a future beyond our current horizons. As the writer in residence, I kept a daily log of my experience during the project, which is composed here alongside paintings by fellow participant Rebecca Farr. This publication investigates the practice of staging “model” or “show” homes as a method for constructing representations of an idealized (white) middle and upper classes. The essay mines personal narrative, pop culture, lifestyle and news articles surrounding the subject of model homes in order to tell a story about mess, debt, and longing to be part of the middle class. This text was printed as part of an artists’ book using 12 pages color laser on cardstock (not shown) and 40 pages green and blue risograph on insulation pink and grout grey paper. This essay traces the intersections between artists’ books and the moving-image through movements such as structuralism and replay culture, to what has been termed the “still generation” of image dispersal through social media. Artists discussed include: Marcel Broodthaers, Michael Snow, John Baldessari, Kim Soo-ja, Pipilotti Rist, Yoko Ono, Shezad Dawood, Daria Martin, Uriel Orlow, Joana Hadjithomas & Khalil Joreige, and Ian Cheng. This essay analyses the work of artists who translate the sky in order to transform our perceptions of the atmosphere, air pollution, and climate change into a more open and embodied mode of understanding. Artists discussed include Karolina Sobecka, Pinar Yoldas, and the Center for Genomic Gastronomy, all of whose practices combine research, design, and material exploration. A program filled with discussions, workshops, debates, experiments and idea exchange between climate experts, creatives and the audience. Weather or Not’s goal is to to make climate change tangible in a playful manner and to let the audience be weather forecasters of their own uncertain future. Published by The Stolbun Collection on the occasion of the exhibition "at least i tried" at The School of the Art Institute of Chicago, Flaxman Library Special Collections (September 2015). Five writers were commissioned to write essays in response to five haiku wall paintings by Rafaël Rozendaal. Read the essays by clicking on the haiku text on the website. This paper examines the role of art and curatorial practice in relation to the Anthropocene, asking what effects Anthropocene-themed narratives developing in the art world might have on the discourse as a whole. A critical review of the traveling exhibition and publication project Animism, curated by Anselm Franke. 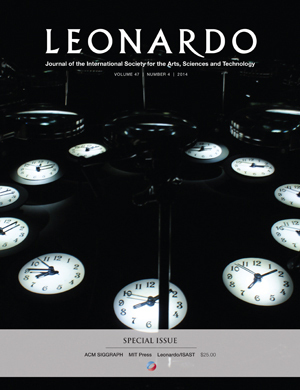 This paper uses Walter Benjamin’s concept of translation between people and things as a focal point for analysis of the work of contemporary new-media artists Paula Gaetano Adi and Lindsey French, who utilize robotics and interactive technology to explore interspecies communication. Framed by materialist, poststructuralist, and posthumanist theory, along with more recent work in object-oriented philosophy, this thesis posits alternative, anti-hierarchical configurations of human subjects and non-human objects. Part I: Artifacts on the Loose is a work of theory-rooted speculative fiction; Part II: Models for an Object-oriented Worldview is a critical exposition of art and curatorial projects in relation to OOO. From 2014 - 2018 I worked as Manager of Library Special Collections at the School of the Art Institute of Chicago, where I directed a public exhibition and lecture program, offered weekly project advising for students and faculty, and served on graduate critique panels while managing an internationally renowned collection of artists’ publications and several archives focused on the history of artist-run spaces in Chicago. In addition to developing a diverse, relevant, and inspiring collection, my focus was on creating opportunities for students to share their curatorial vision and research across campus and with the broader Chicago community. To get a sense of the exhibitions and events I facilitated in this vein, visit the online exhibitions archive. Media Grrrl is an open network of female identifying media artists in Chicago. Through monthly studio critiques and other programming, Media Grrrl offers a safe space for artists to share their work outside of Chicago's mostly male-dominated new media scene. The group brings together artists from different circles and disciplines within the media arts in order to foster community and collaboration. Gender non-conforming artists are also welcome - if you feel unserviced by the patriarchy, feel free to join us. Though the main core of our activity happens in Chicago, telecommuting members are welcome. We currently operate through a secret Facebook page. To join, message me, or email me at kander7@saic.edu. Deep Time Chicago is an art/research/activism initiative formed in the wake of the Anthropocene Curriculum program at HKW in Berlin, Germany. The initiative’s goal is to explore one core idea: humanity as a geological agency, capable of disrupting the earth system and inscribing present modes of existence into deep time. By knitting together group readings, guided walks, lectures, panels, screenings, performances, publications and exhibitions, we hope to develop a public research trajectory, offering a variety of formats where Chicago area inhabitants can grapple with the crucial questions of global ecological change. Learn more and subscribe to updates at deeptimechicago.org. As part of Deep Time Chicago’s visiting artist program with ACRE, I assembled an Anthropocene Library for the residents. 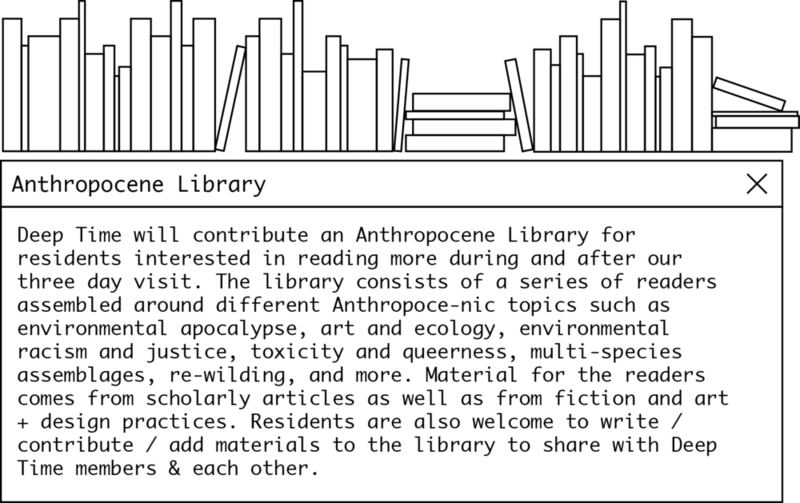 The library consisted of book collection alongside a series of readers assembled around different Anthropocene topics such as environmental apocalypse, art and ecology, environmental racism and justice, toxicity and queerness, multi-species assemblages, re-wilding, and more. Material for the readers came from scholarly articles as well as from fiction and art + design practices. After the residency session, the readers are accessible at ACRE’s gallery space in Chicago. To browse the reader and library contents, click here. To see the full schedule of activities Deep Time led at ACRE, click here. Through an exhibition, satellite library, and series of events, Post/Natural explores how artists are approaching the Anthropocene, post-natural landscapes, ecology, environmental activism, and disruptions of the binary between ”nature" and "culture." Because the Anthropocene is a topic that traverses the sciences, humanities, and most recently visual arts, Post/Natural takes artists’ publications as a focus point to ask what kinds of dialogue might develop from bridging scholarly and aesthetic modes of production. Like Laboria Cubonix in their Xenofeminist Manifesto, Post/Natural seeks to chip away at the concept of “Nature as an un-remarkable given,” investigating different Nature-Cultures, how they are constructed and what happens when they collide. For a list of artists and documentation click here. A screening of video and 3D animation works in conjunction with the exhibition Post/Natural in Flaxman Library Special Collections. 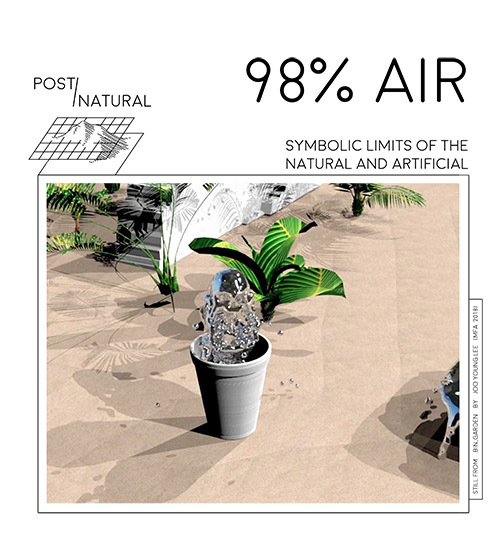 98% Air (taken from the material composition of Styrofoam) prods at the symbolic limits of the natural and artificial, utopian and dystopian. A common thread throughout the works screened is a sense of buoyancy: what might we see (by) floating on the horizon? Works by Jooyoung Lee (MFA 2018), Lindsey French (Faculy, Art & Tech), localStyle (Jay Alan Yim + Marlena Novak (Faculty, FVNMA)), Meg Erwin (BFA 2017), Nick Flaherty (BFA 2017), Selden Paterson (BFA 2013), Snow Yunxue Fu (Faculty FVNMA), Ricardo Cobian (BFA 2019), and a site specific installation by Tiana Birrell (MFA 2017). Read the program here. Part of Post/Natural. How do we perceive and receive the sun? Join us as we absorb and amplify through time-based works by Kamau Patton (Faculty, Visual and Critical Studies) and Lindsey French (Faculty, Art & Technology). To do this, we’ll be journeying closer to the sun (weather permitting) where the Social Solar class has been charging a solar-powered battery throughout the semester. View documentation here. Part of Post/Natural. Unsettling the Canon comprises a participatory bibliography and collection of texts on themes of indigeneity, colonization, and racism: resources for understanding and combating systemic oppression and white supremacy; decolonial and inclusive methodologies for education/arts education; and alternatives to the dominant (Eurocentric, white supremacists, cis-gender, patriarchal, heterosexual, colorist, ableist) art canon. The bibliography will be available to the SAIC community online, with a selection of key texts to be produced, assembled, and distributed in print form during the Bibliodérive. See the bibliography in progress & suggest a text. Bibliodérive is the application of the Situationist International practice of the dérive or “drift” reapplied to the realm of research, libraries and archives. The Flaxman Library bibliodérive is a collection of generative, open-ended actions, or situations, taken to destabilize research practices geared towards an expected product or outcome, the gathering of information to merely support extant ideas and thought structures. It is a disruption in the traditional use value assigned to the library, the archive, to information storage and even to the very concept of research itself. An impromtu reader assembled and distributed throughout campus at The School of the Art Institute of Chicago. Amidst a cyberworld of constantly shifting information, fake news sources, and deceptive headlines, we thought it would be helpful to make a physical record of some of the documents and details that have emerged since the election. These documents range from self-health guides to calls to political action, and speak to the wildly unsettled moment that we’re all existing in. We hope this reader gives you the chance to power down, sit still with uncertainty, and look to the future. To view a PDF of the reader, click here. In linguistics, code-switching occurs when a speaker alternates between two or more languages, or language varieties, in the context of a single conversation. But beyond this connotation, code-switching is a phenomenon that references any way in which we subtly, reflexively change how we present ourselves. It becomes a means of expressing different parts of our individual identities, in different cultural and linguistic spaces. Highlighting this spectrum of code-based art, the work in code/switch will explore technology as subject as well as medium, and will offer a survey of art that critically reflects on the creative use of tech, through a socio-cultural lens. This immersive and interactive exhibition brings together a range of artists, filmmakers, architects, designers, musicians and game developers, all pushing the boundaries of their fields using digital media. For a list of artists and documentation click here. Interstice - what experiences are afforded at the borders and boundaries of dispersed and granular community? What is defined and redefined at the dynamic edges of identity, body, form? The show will include selected work by Carolina Fernandez Del Dago, Emily Eddy, Lindsey French, Stephanie Graham, Snow Yunxue Fu, Stephanie Graham, Sanglim Han, Selden Paterson, Slaveya Minkova, Nhung Walsh, and Jenyu Wang. In 2014 I was a research fellow for the Hans-Ulrich Obrist Archive, where I worked on developing a bibliographic database and catalog of the archive, organized (1,2) exhibitions, and contributed to the archive blog. Freeze-Frame is a showcase of works from the Joan Flasch Artists’ Book Collection that relate to film, video, and other moving-image based practices. These works, many of which are authored by artists working primarily in film and video, explore the book as a time based medium in itself. By halting the moving image, these artists are able to expand the space between finite moments and to let the viewer take control page-by-page, frame-by-frame. For a list of artists and documentation click here. Slaveya Minkova and Emma Robbins investigate the construction of history through artifacts and respond by creating their own hybrid cultures. Using photography, video, and installation, each artist operates as a guide, leading viewers through a contested terrain of images. Like a History Channel documentary filled with dramatized reenactments, work occupies a space between historical reference and invented persona, resulting in a series of imagined realms that parallel the present.